A number of rock anchors were installed and tested to destruction at Swinburne crag Free State, South Africa. There had been some concern that due to the nature of the rock, soft sandstone, that some of the existing rock anchors would be weaker than what was originally thought to be the case at the time of bolting. In fact, it appears that ALL the anchors fall short of what would seem to be the desired safe working load and should be considered on a bolt-by-bolt, route-by-route basis for replacement. Based on the testing, and the background literature, a number of conclusions and recommendations have been made about rock anchors for climbing use, not only in this type of rock but in general. These cover their design, regulation of manufacturers and suppliers, testing, and installation. The conclusions are not exhaustive and the authors hope that this report will assist the South(ern) African climbing community to develop a set of standards and guidelines to increase the level of safety in sport climbing. 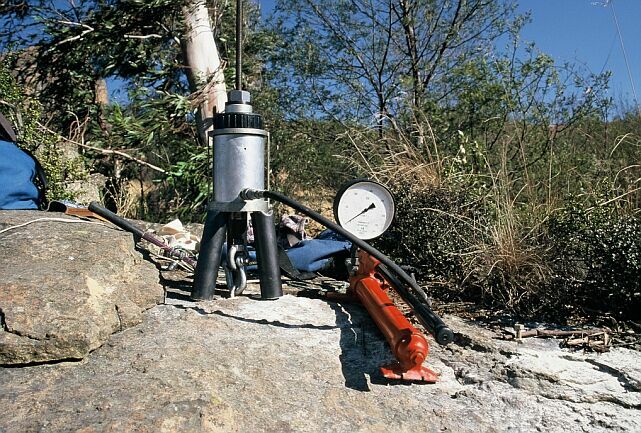 A number of rock anchors were installed and tested to failure at Swinburne crag, Free State, South Africa. This report is intended to fully document the testing, as well as to analyse the results. A more basic summary can be found on the web page . Some anchors are weaker than what is believed to be acceptable. They might have to be either inspected and/or replaced. This was not due to negligence on the part of the bolters, who generally followed the currently accepted bolting standards and in general co-operated with and encouraged this testing program. Some bolters even placed test anchors specifically for anchor validation. In brief, the Davies U-Bolts are unlikely to fail in a dangerous manner, but are below the desired strength. All other anchors are potentially unsafe and must be evaluated on a case by case, route by route procedure. Ideally all existing anchors should be considered for replacement. The Davies U-Bolt, and all other U-bolts, at least those placed in this type of rock, have interference from their close leg spacing (close in terms of normal civil engineering practice for rock and concrete bolts). This interference tends reduce their potential pullout load. They are also shorter than what is required for this type of rock. The glue-in procedure and type of glue used is of crucial importance. The practice of placing a glue-in bolt in the same size hole results in an under-strength anchor. The anchor will be much stronger, as well as provide more consistent results, if placed in a larger hole. The Upat glass ampoule provides very good bonding for this type of sandstone. The Hilti cartridge glue used (HIT-HY150) and Epidermix 372 did not bond sufficiently well in this rock type. It is possible that other Hilti or Upat cartridge glues will prove better for this type of sandstone. Both the installed rock anchors at Swinburne as well as a large number of the rock anchors available to South Africans are not made according to any standard, in particular some of the locally made ones. Not all local ones are variable although, those of Vektor, Upat, and Alpha-Vertical, are of a high quality and are well designed. The authors tested a number of climbing anchors at Swinburne, south of Harrismith, in the Free State, South Africa on June 10th and 11th 2000. The rock is fairly soft sandstone, not unlike that at the nearby “Mt Everest” crags, at Harrismith. To date, routes at Swinburne have been bolted using mainly U-Bolts, from various sources. There was concern about the integrity of the anchors due to the soft/friable nature of the rock. To the authors’ knowledge, this is the first in situ, quantitative anchor testing done in Southern Africa. More testing is planned on other rock types. Andy Davies . This is the only (to the authors’ knowledge) South African anchor maker to perform testing. A variant of the Swinburne U-Bolt design was tested in shear (3 tests) and in tension (3 tests) in 50 MPa concrete. They were also tested in fatigue (20 000 cycles). Corrosion fatigue was not considered. The existing Davies U-Bolts were not tested: an earlier variant with closer leg spacing was used. The American Safe Climbing Association  has also examined rock anchors, and has looked into methods of re-bolting sub-standard routes. The U.K. National Caving Association has an active Technical Committee  that tests and does failure analysis on rock anchors. The following terms are used in this report. M8, M10, and M12: type of thread, of nominal 8, 10 or 12mm diameter. Rolled or Cut Thread: the thread on a bolt can be either machined on (“cut”) or formed by mechanical deformation (“rolled”). In general, rolled threads are better but are much more expensive. Stud: threaded or grooved rod, a hanger is held on by a nut and washer. U-Bolt: has three critical dimensions: diameter of the U-Bolt, spacing between the legs (centre-centre), the depth that the legs are embedded into the rock. In addition the roughness of the legs determines how well the glue bonds to the steel. Legs are either grooved or threaded to assist this bonding. Mechanical Expansion Bolt: a proprietary bolt that forces an integral wedge(s) to expand around the leg as the bolt is tightened. It puts the surrounding rock into compression. Glue: generic term for the bonding system. Can be either”simple” epoxy glue or with an aggregate mixed in to provide extra strength (termed a “grout” or “mortar”). Curing (Time): glues require time to set and develop their full mechanical properties. Glue starts to develop these at commencement of curing, and has 100% strength at the end of curing. Curing can take from hours to days, depending on the type of glue and temperature. Gel Time: the time period in which glues are workable after mixing the two components, and before they start to cure. Figure 1: Anchor Loaded in Tension/Pullout Mode Tension: when the anchor is loaded parallel to its leg(s), so as to tend to pull it straight out of the rock. Shear: when the anchor is loaded perpendicular to its legs, parallel to the rock. Most anchors are loaded by a combination of shear and tensile forces. Figure 2: Anchor Loaded in Shear Mode Yield Load: the load at which an anchor begins to deform plastically, that is, to suffer permanent deformation. Tensile Load: the maximum load that an anchor can support. Characteristic Failure Load: Calculation of Statistical 5 Percentile by using the arithmetic mean and standard deviation (i.e. usually Mean – 3 times standard deviation or appropriate. A factor of two standard deviations could be used on a large number of tests, in excess of 40. Safe Working Load: Calculation of Design Load by using Safety Factor of 3.0, or appropriate. That is: Safe Working Load = Failure Load/Safety Factor. Fall Factor: is the ratio of fall that is taken divided by the length of rope that absorbs this load. The system used in climbing consists of a climber in a harness attached by a dynamic (energy absorbing) rope to a belayer. The loading on the system in the event of a fall is a function of the climber’s weight, the type of rope (how absorbant or springy/stretchy it is) and the type of fall, measured by the fall factor . The most common anchor used at Swinburne is a U-Bolt (U2) made by Andy Davies of Cape Town. It is made of 316 stainless steel, of 7mm diameter, 50mm leg-leg spacing, and is embedded 60mm into the rock. The embedded part of the leg has an M8 thread rolled onto it to give the glue something to key onto. There are a few other types of U-Bolts, either made by local climbers or from old South African Railways stock. Pictures of the tested anchors are in Appendix 4. The international climbing community in North America, Europe, Africa, Austral-Asia and elsewhere does not have any standard bolting practice or follow a particular standard. 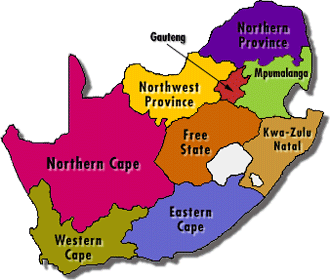 The Cape Town Section of the Mountain Club of South Africa (MCSA ) has drawn up an initial set of “Guidelines for The Western Cape”. This is a start for the region, although an excellent beginning, it is not yet complete, as will be seen later on. The European Community comes the closest to having guidelines with the adoption of the Personal Protective Equipment (“PPE”)series of standards for both leisure and industrial safety equipment . In particular, two standards are of interest, EN 795 and EN 364. These have been “imported” into the South African Bureau of Standards as SABS EN795, and EN 364 [7,8]. In general, these specify that anchors must withstand a Fall Factor 1.0 fall of a 100kg mass (on a 2.5m long dynamic rope). Note that there is a somewhat confusing issue here. This European PPE set of standards deals only with PERSONAL equipment. Anchors are not personal. Therefore standard EN 959 (“Mountaineering Equipment: Rock Anchors – Safety Requirements and Test Methods” ) has been withdrawn  from the PPE series. However, it is STILL in force. Petzl manufactures its anchors according to it . The Union Internationale des Associations d’Alpinisme (UIAA) dynamic rope test is often used as a means for specifying strengths of climbing gear. An 80kg mass for a single rope, and 55kg for a half-rope, is dropped on a 2.8m rope in a 5m fall: Fall Factor 1.78 ). Its main purpose is to measure the impact load absorbed by the rope: a maximum of 12 kN is allowed to be measured on a force-meter during the first test. Its secondary aim is to determine how many falls they can suffer before failing or showing damage (rated as the number of UIAA falls). If you merely change the belay device to a Gri-gri (with the same as before), the anchor load DOUBLES, and increases to 10kN (this is because a Figure-8 or Sticht-plate allow some rope to slip, and thus absorb energy. A Gri-gri locks up, by design, and does not absorb energy). If you add 20kg to the climber (now 100kg), it goes up to 11kN. If you change the rope to the “borderline 11mm UIAA” rope (the stiffest allowed), the load goes to 16kN (all else the same as above). This is what the SABS EN 795 test could generate, depending on the rope used (the standard specifies a “three strand 12mm diameter hawser laid polyamide (nylon) rope complying with ISO 1140”). If you increase the Fall Factor to 1.5 (all the above conditions as well), the anchor load goes to 20kN. Based on this, it would seem reasonable to base the load that an anchor should be designed for at 16kN. This is what the SABS EN795 uses, as well as what the rock anchors could well take: 100kg climber (body plus clothes and gear), a Gri-gri, using a stiff but still dynamic rope, and a Fall Factor 1.0 fall. The maximum load could be 22-23kN, but anchors would not normally see this (a fall above Fall Factor 1.0 is quite unusual in bolted routes, and would tend to be possible only on multi-pitch sport routes on anchor/stance/belay points which are doubled-up). Therefore, rock anchors should probably be tested to destruction, and have much bigger safety factors than other climbing gear. The authors decided to load the anchors to failure in tension as well as in shear, thus allowing one to calculate their safe working loads. This means that enough tests (three minimum) must be done for each case to get an idea of the spread/range of results. An average (arithmetic mean) of each testing case as well as the standard deviation can then be calculated. The “three sigma” approach (the arithmetic mean minus three times the standard deviation) can then be performed to give a quantified result for the strength of the anchor in both shear and tension. Then, bearing in mind that anchor installation is carried out under adverse conditions by relatively unskilled people, and in brittle base materials (rock), a safety factor should be applied to these failure loads to arrive at a Safe Working Load, both in tension and shear. This formula allows one to determine if the actual applied loads (measured or calculated) are within the design limits (allowable loads) on the anchor. The anchors were tested by slowly applying the load, rather than under impact. This was partly due to practicalities (it would be much more difficult and would require enormous amounts of tests to determine impact failure loads). In addition, the maximum impact loads have either been measured (both in South Africa  as well as in numerous places overseas [10, 16]) or they can be calculated [4, 12, 14]. The difference between an impact load and a steadily applied one on a rock anchor is reasonably well understood as well. A hydraulic testing machine from UPat was used for the testing (Figure 4). It is equipped with a hydraulic piston and pressure gauge. It was calibrated against an electronic loadcell; itself calibrated by the SABS. A jig was made to enable the hydraulic rig to be used to test anchors in shear, as well as in tension/pullout (Figure 5). The anchors were placed on the horizontal flatter parts of some large boulders (top was 5m by 10m at least) at the base of the crag. This was for more convenient testing. The possibility that this rock was weakened due to more frequent water exposure was not investigated. It was “bone dry” at the time of testing. The majority of anchors were drilled and glued on Saturday, left to cure for at least 16 hours and pulled on Sunday. This should be more than sufficient time for the Upat and Hilti glues. It is likely that the Epidermix 372 was not fully cured (full cure takes 7 days) within this period. The following anchors types were tested, 38 in total. The types are summarised in Figure 6. Refer to Appendix 3 for images of the bolt types. An attempt was made to perform at least three tests on each variety in both tension and shear mode in order to get statistically significant test data. Due to time, battery, and glue restraints this was not accomplished for all variants, but the results allow analysis of both the existing bolts on routes of the crag, as well as other potential anchors. The determination of the yield failure load was somewhat subjective. The U-Bolts in particular started to permanently deform at fairly low loads, and sometimes the glue would develop small cracks. The initial load at which deformation began was noted, as well as when significant deformation occurred. The Yield Failure Criteria was based on this. The Ultimate Load Criteria was easier to judge, and was basically the maximum load that the anchor could support. In the case of shear testing of the longer U-Bolts, they underwent a lot of plastic deformation/stretching, making it difficult to completely test them. Thus an estimate was made of their ultimate load. Pictures of all the anchors, of the failures, and of the testing rig are in the Appendix. The test data is summarised in the following tables, Figures 11 to 14. It is common practice by anchor manufacturers to use the “Three Sigma” (1,2,3,6) or a related approach to analyse actual testing data. That is, to use the arithmetic mean and the standard deviation of test data to calculate the statistical spread of the data. Note that this assumes that the data is of Normal Distribution. Since the most common anchor failure mode is by rock fracture, a brittle material, it is possible that this assumption is incorrect. Perhaps a Weibull Distribution would be a better match. In this case, more than three data points would be required, probably at least ten. This could be investigated in future testing. However, the assumption that the data is of Normal Distribution is unlikely to cause significant errors in anchor safety evaluation, bearing in mind that three standard deviations are used, as well as a reasonable factor of safety is applied as well. The various anchors had quite a large variability to their failure loads in tension, but not so much in shear. This is to be expected. Tensile failure depends largely on the base material, shear to a lesser extent. The base material (rock) at Swinburne is quite variable, as was observed by drilling into it. The anchor manufacturers [1,2,3] provide recommended hole diameters, anchor spacings and embedment depths for their glue-in studs (as well as for their mechanical expansion anchors). These are summarised in Figure 15. The bond is VERY critical in the Swindburne sandstone. The Upat capsule (UKA 3) glue appears to infiltrate the sandstone much better than the other glue types tested. This is shown by comparing the mean tensile loads on S1 (Upat glue) of 51.5kN to that of the others which were far lower. The Epidermix was also much messier to use than the capsule & cartridge glues nd required care on the operator’s part to mix it properly. It is likely that poor mixing could lead to bond failure. The diameter of the hole is sometimes varied for the same diameter glue-in anchor. Although this effect was not investigated in detail, it does not seem to be a good practice to insert, for example, a 12mm U-Bolt (U5) into a (nominal) 12mm hole with a small amount of glue squeezed in/out (an “interference fit”). This can be seen by comparing the U-Bolt (U5) to all the other U-Bolts of 50-60mm embeddment. The U5 failure load is much more variable and the mean is lower. The problem here is that attempting to force a 12mm piece of steel into a 12mm hole in rock will compress the steel, but not do much to the rock. It will only require a small amount of material movement/relaxation to reduce this confinement force. And as seen with the Hilti versus Upat glue, the bonding is CRUCIAL to bolt failure. This sort of force fit does not allow much bonding to occur. The Epidermix data sheet  notes that there is a relationship for ultimate average bond strength as a function of the diameter ratio of the hole to the bolt, assuming that the bolt is embedded at least 15 bolt diameters. The ultimate average bond stress is at its maximum at a ratio of 1.30:1. (That is, an M10 bolt glued into a 13mm hole, or an M8 into a 10mm hole). As the ratio increases (that is, the hole increases), the bond stress reduces by 20% to a ratio of 1.67:1. After this it remains constant. This is based on the assumption that the glue forms a strong bond, and has a strength equivalent to that of the base material. For Epidermix 372 in concrete, this is a reasonable assumption. Hilti  states that strength is a linear function of depth up to a certain maximum for each diameter of anchor. It follows that anchors installed in less than the nominal depth are weaker. As was seen in the example calculation in 6.1, the Davies U-Bolt suffered from a reduction in potential pullout strength due to its close leg spacing. As can be seen in Figure 15 (Anchor Spacing: no effect), an M8 glue-in stud would require 160mm spacing for no reduction in strength. The Davies U-Bolt has only 50mm. The illustration in Figure 16 shows why this is so. When an anchor fails due to base material fracture, it tends to pull out a cone of rock. If two closely spaced bolts fail, the cones overlap, weakening them both. Figure 16: Effect of Anchor Spacing Overlap Note that if one uses Hilti’s formulae  to analyse the data from Davies’  earlier testing of U-Bolts, then it can be seen that, as would be expected from rock fracture mechanics , that there is interference from the relatively closely spaced legs (40mm) of the Davies U-Bolt. Davies  notes that using the same glue (Hilti C-100), single M8 glue-in studs installed in 54MPa concrete (close to the 50MPa tested) display an ultimate tensile strength of 20kN each. If one observes that TWO M8 studs would provide 2x20kN = 40kN, against the Davies 29.1kN, then it can be seen that there is “interference” of 10.9kN. Using Hilti’s fa.N = 0.63 for a 40mm anchor-anchor spacing (the initial Davies U-Bolt legs were 40mm centre-centre), then 40kN x 0.63 = 25.2kN. Best by far is the M10 glue-in stud with Upat capsule (S1). Although there were no shear tests done with it, it should behave just like the M10 glue-in stud with Hilti glue (S2). This only deformed under shear due to the HANGER, the bolt itself was fine. It will thus likely hold any factor 2 fall, in shear or tension. Note that the failure load of 48.1kN over an effective area of 52.3mm2 implies an ultimate tensile strength of 920 MPa for the stud, within the range of the carbon steel used (n.b. AISI 1050 has UTS of 900-1100 MPa). Upat specifies an UTS in excess of 800 MPa. The Hilti M10 mechanical expansion bolts (M1) were good in shear (will behave like a glue-in stud in shear). In a big tensile load, they will start to pullout, making them less able to survive further falls. number tested/rock variability: only two 8mm bolts were tested, it is possible that these gave two gave unusually high results. If more 8mm studs were tested, perhaps due to the variability in the rock, the average would drop. bond failure: as has been noted, the bonding/glueing is crucial in this rock. Perhaps the method of installing the 8mm stud in a 10mm hole, as opposed to a 10mm in a 12mm hole affects its pullout strength. It is not clear what this mechanism would be to account for such a significant bonding strength difference. These were quite variable in pullout/tension. They will probably not fail (and thus not result in a death or injury) but will suffer deformation under a big fall. In shear, they are strong, but will also likely deform under a big fall. These were very variable. The U-Bolt itself is very strong (12mm diameter galvanized high tensile steel). However, they were placed in tight holes (12mm leg in 12mm hole). This tended to reduce their potential strength, based on their embedment depth and leg spacing. Also note that they used Epidermix 372 glue, which is not fully cured at 24 hours (requires 7 days for full cure). The longer the leg, the better. Compare the Characteristic Failure Load (Mean – 3 Sigma) results of the 120mm deep Long U-Bolt (U1) of 10.9kN versus the 60mm deep Davies U-Bolt (U2) of 7.4kN. The wider the leg spacing, the better. The Davies U-Bolt (U2) is 50mm wide with a characteristic ultimate tensile load of 17.9kN, compared to the Wide U-Bolt (U3) of 80mm 18.9kN. However, note that the wider U-Bolt variant (U3) had a very large scatter, probably due to the ease with which its legs deformed. The U-Bolt would have to be stiffer (bigger diameter and/or stronger material) to take proper advantage of the bigger leg spacing. Another indication of leg spacing effect is seen by the ultimate failure load of the M8 glue-in stud (100mm embedment) to the Davies U-Bolt (60mm embedment). Both used Hilti cartridge glue. The mean ultimate failure loads are the same (17.9kN), although the U-bolt has TWO legs (60mm each) to the ONE of the stud (100mm). A potentially serious design point is the effect of the thread as a stress raiser. As can be seen in Appendix 5, one of the long U-Bolts (U1) failed under shear at the thread/rock interface. (This type was designed for testing and not use .The threads extended all the way over the U-Bolt, and thus would both weaken the exposed portion, as well as be rough on carabiners and ropes). However, if a Davies U-Bolt’s threads were not totally inserted into the rock, the same could happen, causing a lower than designed for shear failure. One way to obviate this would be to either ensure the U-Bolts are inserted all the way into holes, or use a potentially lower stress raising leg roughening method: like knurling or similar. Only one of the Fergusson U-Bolts (U6) was tested. It failed at quite a low load of 11.0kN. This is significantly less than the similarly dimensioned Davies U-Bolt’s (U2) failure load of 17.9kN. This was probably due to its placement in a tight hole (8mm-diameter bolt in an 8mm hole). Although the longer version should be stronger. A potential problem is that one cannot tell from looking at the longer/deeper variants of the Fergusson U-Bolt if it is a LONG or SHORT version once it is installed. The rock at Swinburne crag is a fairly soft, friable sandstone. If one compares the pull-out failure loads of the anchors tested in it to concrete testing then, it might be possible to rank it to both other crag’s, as well as to concrete. Note that Powers  has a “rule of thumb” that compares anchors in soft rock such as limestone or sandstone to those placed in 14MPa concrete, and in harder rock such as granite or marble to those in 28MPa-42MPa concrete. However, as can be seen by the following, this is not applicable to the friable Swinburne sandstone. The anchor manufacturers publish data [1,2,3] on testing in both 20MPa and 50Mpa concrete. This data was adjusted to the same basis as that at Swinburne. The following table compares the calculated values for the different rock anchors. The Upat glue-in M10 stud (S1) is the strongest of all the anchors, although close to the value of the Hilti M10 stud. This is probably due to its failure mode. The metal sheared, as opposed to the rock breaking in the other Swinburne tests, and possibly in the Hilti data. Comparison of the Hilti M8 glue-in Stud data for 20 and 50MPa concrete with the Swinburne M8 data shows that the rock is significantly weaker than concrete, as is shown in Figure 18. The line at 17.9kN indicates that the sandstone lies below the concrete compressive strength curve. It is entirely possible that other types of rock will lie above this line. Figure 18: Graph of M8 Glue-In Stud Characteristic Tensile Strength against Base Material Strength It is not surprising that a straightforward correlation between one base material property, such as compressive strength, cannot be used to predict anchor strength. In the case of anchor failure by rock fracture, the base material compressive strength is not going to play much of a role, as compared to the fracture toughness of the rock. Note that carabiners (and most hangers) have a failure rating of 20-22 kN: this is not their Safe Working Load. It is the load at which 95 out of 100 hangers will not break (5 percentile). But the other 5? But since they are METAL parts, and are attached to another METAL part, the safety factor does not have to be 3, it can be between 1 and 2. If one uses the Hilti guide of 1.75 for steel-steel failure safety factor, then their Safe Working Load would be around 13kN. And hangers are replaceable if deformed, whereas glue-in studs, mechanical expansion bolts, and U-Bolts are not easily replaced. Perhaps these criteria could be reduced for some existing bolts. The MINIMUM would be a load of 100kg climber at Fall Factor 1 on a fairly stretchy 10.2mm rope. This is around 10kN. One must then decide what the minimum safety factor would be. None of the existing anchors installed at the crag appear to be very satisfactory. Therefore, a new type(s) should be used for new anchors. Using the more exacting initial standard, ALL of the existing Swinburne U-Bolts fails the criteria. An unknown number of the SAR U-Bolts might fail. Although their AVERAGE tensile and shear rating is greater than 14kN, they are VERY variable. Thus, some could well fail at much less than 5kN load. The Davies U-Bolts (U2) will likely deform under both shear and tensile loads, but will be unlikely to fail. A climber taking a big fall on them will likely deform them, requiring their replacement if they are badly deformed. The Fergusson U-Bolts are more problematical to analyse. Based on the limited testing (one U-Bolt) and comparing to the Davies (U2) and Long U-Bolt (U1), it would seem that the deeper version (100mm as opposed to 50mm) might be strong enough. However it is likely that even this deeper version’s performance will be varied due to their installation in “interference fit” holes (8mm leg in 8mm hole). And how does one tell by looking at an installed bolt what length it is embedded in the rock? They both look the same from the outside. Unless one was sure that the bolt was the long variety, then this type is not inherently safe. The Davies U-Bolts appear (barely) strong enough to remain, but no more should be placed at Swinburne, or in other soft sandstone crags. All other U-Bolts at Swinburne appear to be potentially dangerous and require urgent evaluation on a bolt by bolt, route by route basis. Ideally ALL U-Bolts and expansion bolts at Swinburne should be replaced. An M10 glue-in with Upat ampoule, and hanger (this is an “off-the-shelf” solution). This combination is EXTREMELY strong in both tension and shear. Mechanical expansion bolts are not recommended. This is because they appear to pull out at fairly low loads. It is perhaps possible that a longer M10 mechanical expansion bolt (Hilti or Upat) with a hanger might work. But it would have to be tested. The authors believe that even if it is deeper than the tested one (M1), it will still probably pull at an unacceptably low load. Perhaps a Petzl eyebolt with Upat capsule glue. The problem is that that the eyebolt is expensive, over R35. A U-Bolt made with a stronger material than 316 stainless (bigger diameter as well), and using better glue, along the lines of the Upat ampoule glue (although one cannot use an ampoule because a U-Bolt does not allow one to “spin” an ampoule in the hole). It is not recommended to have smaller leg spacing than the tested ones of 50mm. Bolters must consider very carefully their glue choice and procedure: it is critical. Epidermix 372 does not appear to be a good choice, because its mixing is quite involved, and its long full cure-time (7 days). It is also quite “messy”. The supply of anchor hardware is not regulated to any extent in South(ern) Africa. Based on the situation at Swinburne, this appears undesirable, being unsafe and uneconomical. It is probably only a matter of time before a serious injury or death occurs in Southern Africa due to substandard rock anchors. And numerous routes might have to be re-bolted before a 30 or 50-year life span, costing significant amounts of money, labour, as well as scarring and defacing the rock. This situation can be significantly improved by introducing some sort of regulation on the supply of anchors. The general quality of imported anchors (from Europe and USA) is reasonably good. The European ones in any event are regulated by the EEC . The quality of the locally produced anchors are more variable. Some are of high standards, and the makers support their product to a high level by in-house testing, quality control, and provide some degree of technical support. Vektor, Upat, and Alpha-Vertical are in this category. The other manufacturers are below this level of quality. It is a poor economy to purchase and install anchors that do not follow this. It is also in the authors’ opinion, unethical and perhaps will have legal ramifications in the event of accidents. It is perhaps possible that either The State (in a Coroners Inquiry in the event of death), an individual in a civil case, or Public Prosecutor in a criminal law suit might have grounds against manufacturers who were guilty of negligence in anchor manufacture. Note that bolters and organisations sponsoring bolting are probably not liable in a legal sense for anchor failure since the sport is recognised as a potentially dangerous one, and that climbers do so at their own risk. However, manufacturers and suppliers are in a somewhat different situation, especially if they profit by supply of the equipment. The testing, analysis and conclusions drawn in this report are based on what was considered to be conservative engineering principles. The opinions are those of the authors’ and do not necessarily reflect those of any other organisation or individuals. This testing was supported and encouraged by the owner of Swinburne who provided free accommodation to the authors. The Johannesburg Section of the MCSA supported the testing financially. Upat Pty. Ltd. loaned their portable hydraulic testing rig and provided technical advice and support. Members of the SA-Bolting List gave constructive criticism and advice, especially: Ian Schwartz, Jacques Raubenheimer, Stewart Middlemiss, and Gunther Migeotte. Note: both gel and curing times are affected by temperature, decreasing as temperature increases. The testing results of Swinburne as well as of Hilti and Powers were compared. The procedures of Hilti were used to adjust the various loads to the same levels. 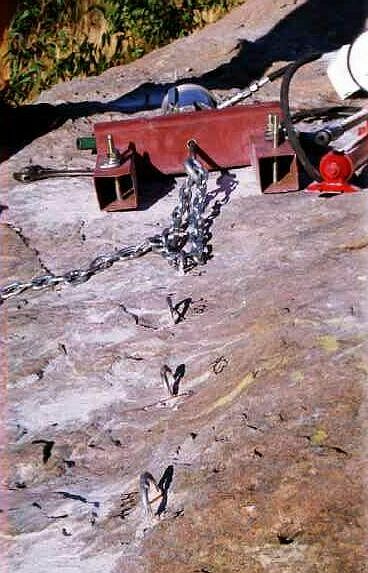 An example of what can occur after unsuitable anchors are used is shown by the notice published by the American Safe Climbing Association  and Ed Leeper. My hangers (95,000 were made between 1962 and 1984) and the bolts they were used with, are no longer suited for the high forces which can now be exerted on top protection by an extreme fall that is locked off or almost locked off. More important, a number of unpredictable cracked-hanger failures have occurred – leading to broken hangers as quite small forces, often less than body weight. Over time, the steel hanger (or sometimes the bolt) had developed a crack almost all the way across. Such “stress-corrosion cracking” won’t be visible. It may occur even where the bolt has held no falls, and whether the bolt is properly or improperly installed. All of my hangers should now be removed to avoid a possible booby trap. A climber who has not seen this notice may count on a single bolt to hold moderate forces (body weight or more) without backup of any kind, though various brands of hangers are known to have cracked this way. Backups should always be set up to hold even after one anchor fails totally. I am painfully aware of the visual scarring removal can cause. I hope that hope that (sic) bolts and hangers will be removed rather than just backed up, and that existing bolt holes can be enlarged and reused. I urge land managers to allow one-for-one replacements. For existing bolt ladders I suggest just leaving the holes empty for hooking. The cleanest bolt removal is to drive a crowbar or heavy claw hammer under the hanger (see replacement technique). I hope to get back many removed hangers for inspection and testing. I will send a bat hook ( narrow Logan Hook) for each six removed hangers I receive. Include a note of where the hangers have been, and roughly when placed, if known. In the past, high-strength alloy steel hangers from some other sources have also experienced cracking, including the one serious accident I know of (three fatalities). Plated steel may not help to avoid stress-corrosion cracking (though a crack can be more visible). Stainless steel or low-temper steel probably will help. his response has been to acknowledge the problem, suggest a solution, and offer to recompense for replacement. The authors believe that this is the response of an ethical, responsible manufacturer.